I loved the G.I. Joe vs. Cobra era—there’s no other way to describe it. When the brand formally re-launched back in 2001 with more than just straight repaints of classic figures it was like I was experiencing a second childhood. The line wasn’t perfect—with some really odd figure proportions and gimmicked weaponry but it did have one thing going for it: new characters. For the first time since Generation 1 ended the Real American Era had new team members fighting alongside the familiar faces from the 80’s. This was the era of Barrel Roll, Bombstrike, Major Barrage, Red Spot, Sgt. Hacker, and Crosshairs. 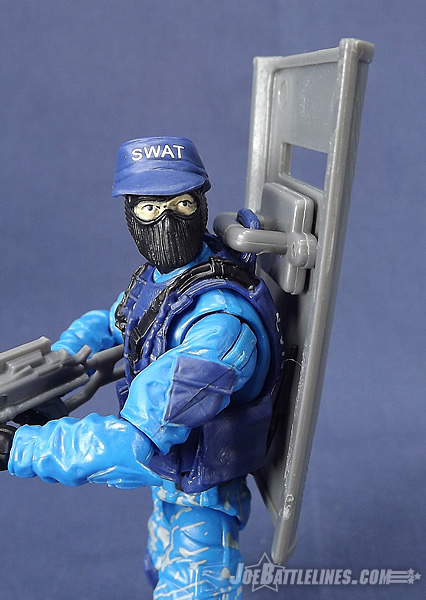 It was also the era that produced a brand-new SWAT team member of the team who took on Cobra with his trusty German shepherd sidekick. As the GvC era came to a close and new Generation 3 era introduced a new construction style many of this characters faded into obscurity. 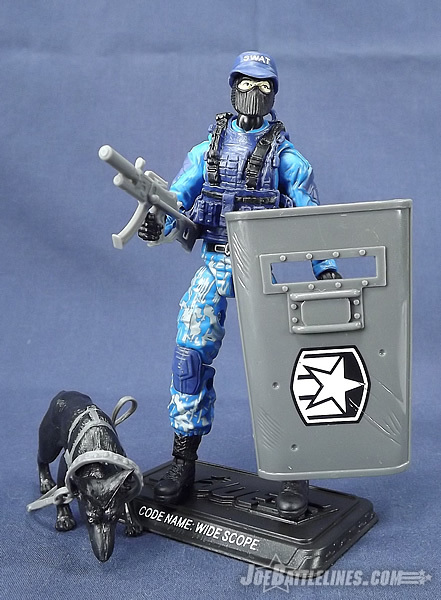 However, that’s to the Collector’s Club and the Figure Subscription Service, a few characters are getting a brand new look—including K9 handler Widescope and his trusty pooch Lamont! Read on and find out two Joe fan’s opinions on this snake-busting dynamic duo! You know Fred, gross proportion issues aside, I was also very fond of the JvC – VvV era. A hallmark of that period was getting us new characters, not just the common core that have become Vomit Characters in the years since then, and all of them deserve a chance to be reborn correctly in modern bodies that are not so cartoonishly looking. 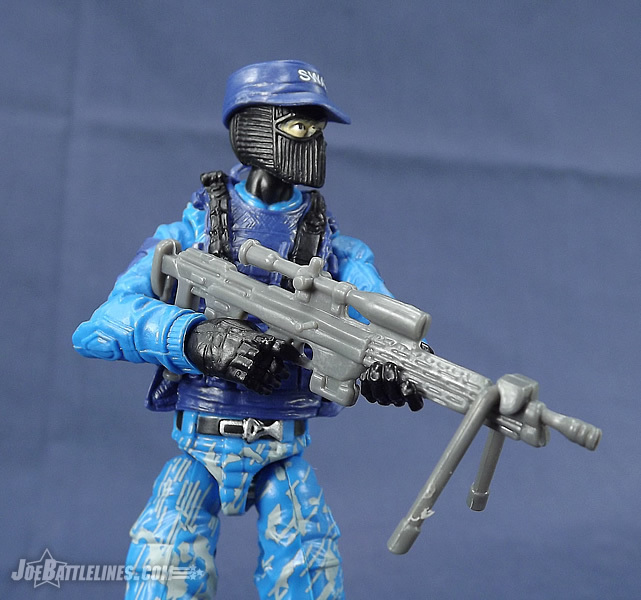 From the neck down, Widescope is based entirely on the amazing Pursuit of Cobra Shock Trooper body. (Someday I’ve got to get caught upon reviews around here!) When the Shock Trooper debuted it immediately became a fan favorite design although to me it always seemed to be better suited for use as a Joe than a member of a “ruthless terrorist organization determined to rule the world.” Apparently someone at the GIJCC agreed and the result is a near perfect body choice for the newest Joe Special Weapons and Tactics specialist. From the add-on tactical vest to the sculpted pockets and pouches, this body works to recreate a practical-looking tactical uniform. 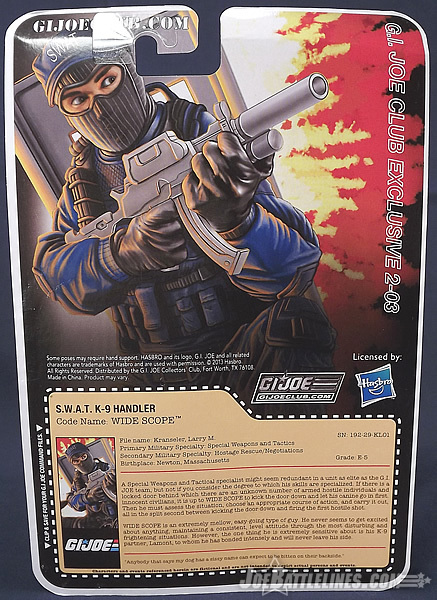 At the same time, the FSS team did an excellent job of mirroring the original color scheme used in Widescope’s 2003 debut release. 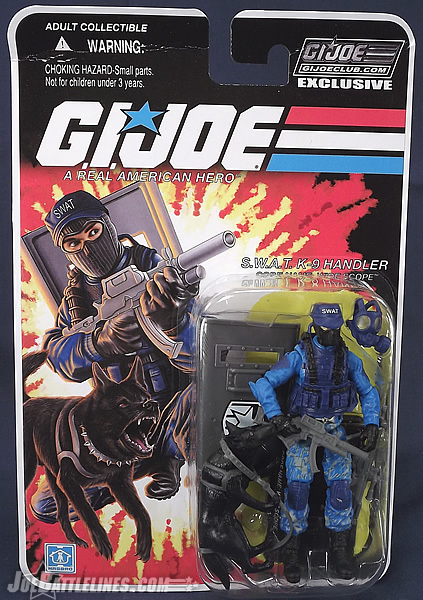 In fact, dare I say it—the figure actually has a better deco than the original whose pant looked more like the recipient of spilled oatmeal than urban camouflage. To me, this body’s color scheme is pure win and the articulation it offers is practically perfect. (If only the right shoulder socket had a greater range of motion for some sighted rifle poses.) So, what say you, Chris? What’s your take on the overall figure design? I like this Wide Scope. At his core, he’s a very simple and very true homage to the original version, but he’s also an understandably lazy addition to the modern style that is almost painful when we factor in how much we pay for each of these figures. However, in this case, the fault lies not within the Club, but of in the Shock Trooper/Steel Brigade body. It’s a near perfect match to make Wide Scope, so it was the most logical choice despite the inclining of overuse with this particular body mold and parts. Thus as a straight up repaint, he is very successful. And really, why not do a successful homage if it’s also easy? 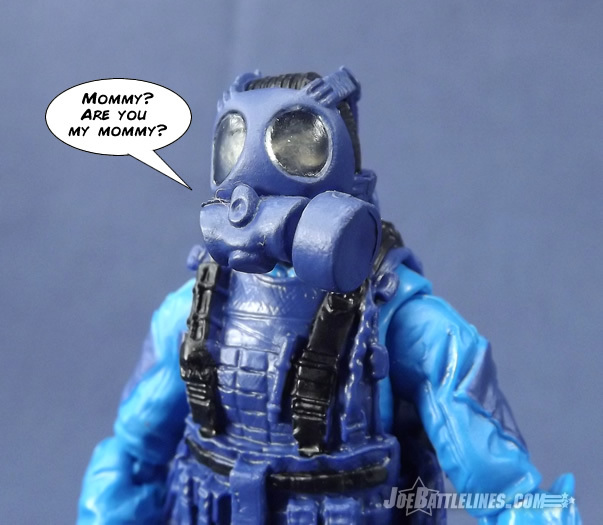 If there was one thing that always frustrated me as a kid it was the fact that certain Joes were perpetually masked. 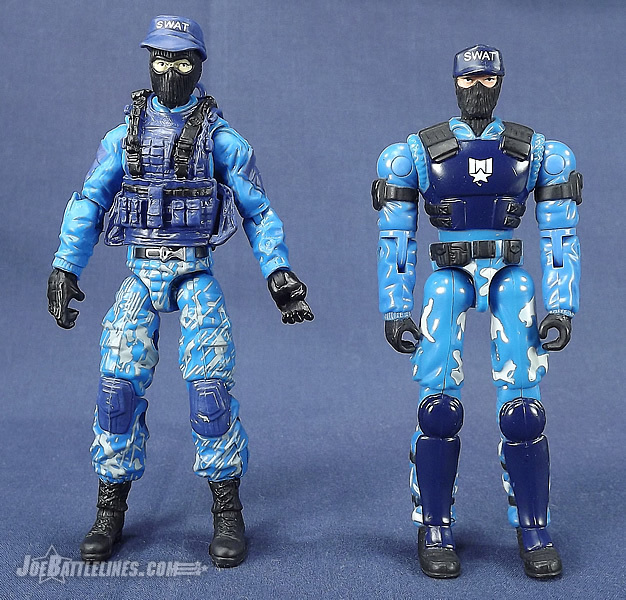 Beach Head, Airtight, Barbecue—these were just a few of the Joes whose faces were always obscured in the original ARAH line. 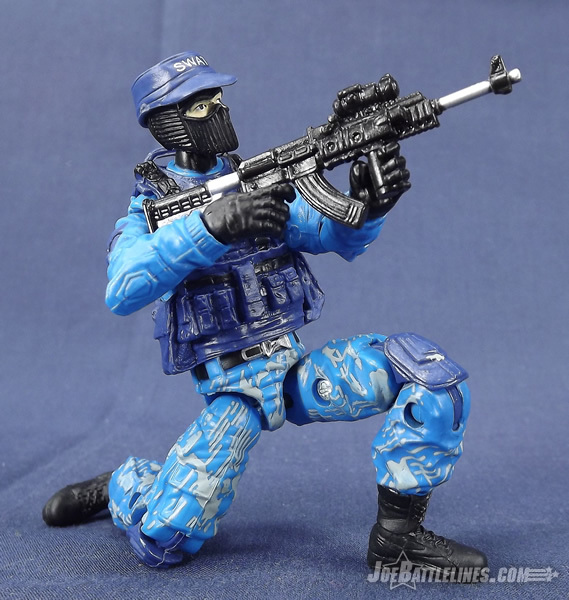 Whereas Blowtorch had a removable mask and helmet, other Joes were perpetually covered by helmets and balaclavas. Sadly Widescope falls into that camp as well. While I understand that packaging a second head might not be cost-effective we’ve seen a precedent for it in the more recent Generation 3 releases. 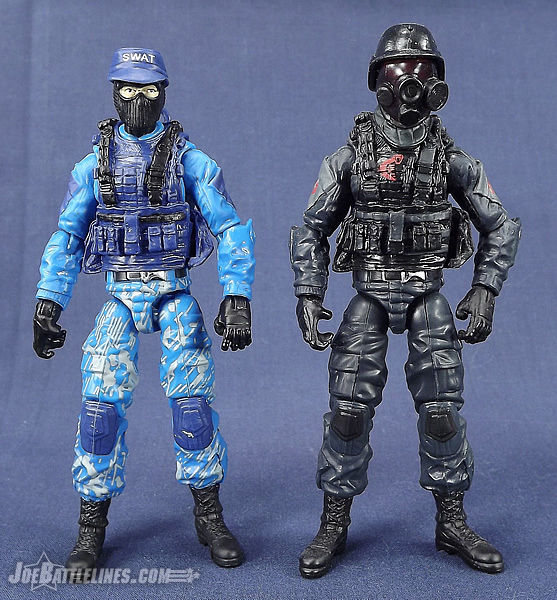 Beach Head was released with a second head when he was packaged with Mainframe (I refuse to call him “Dataframe”…) in the 25th Anniversary comic packs and the 30th Anniversary release of Snake Eyes came complete with 2 different heads. 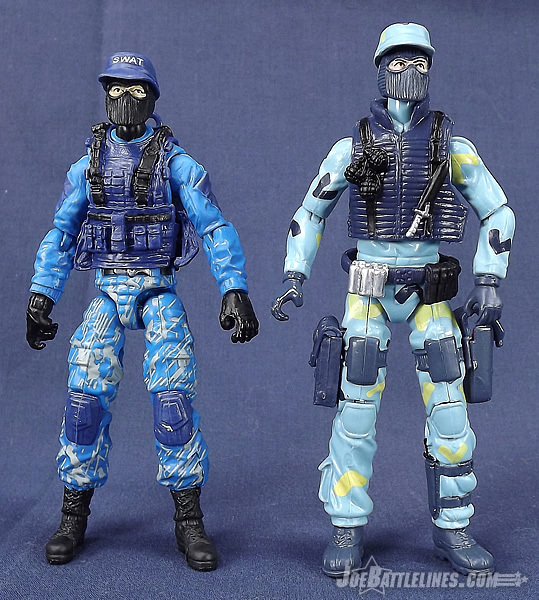 It might have been nice to see Widescope receive the same treatment so that fans could display him both masked and unmasked. Plus, since he’s a never been shown unmasked before there’s no worries about choosing the wrong likeness! 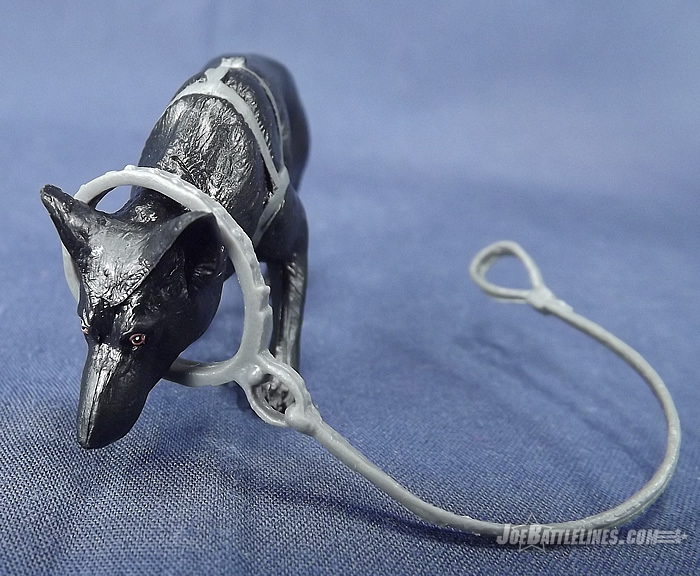 Perhaps the GIJCC could someday release an “accessory pack” for the FSS and include some alternate countenances. Hmm… there’s a thought. Of course, Chris might think I’m being too picky on that one. Nope, I agree! But in this case, I agree. Let’s face it; Wide Scope is just another version of Shockwave. And while he’s true to form with the original Wide Scope, he could have been updated to have a newly tooled head from Boss Fight Studios, or even have two heads like you mentioned so the alternate portraits would separate him from Shockwave’s iconic look. While each is their own worthy character, they look too similar for my tatses as they currently stand. In terms of gear, Widescope is a bit of a mixed bag. 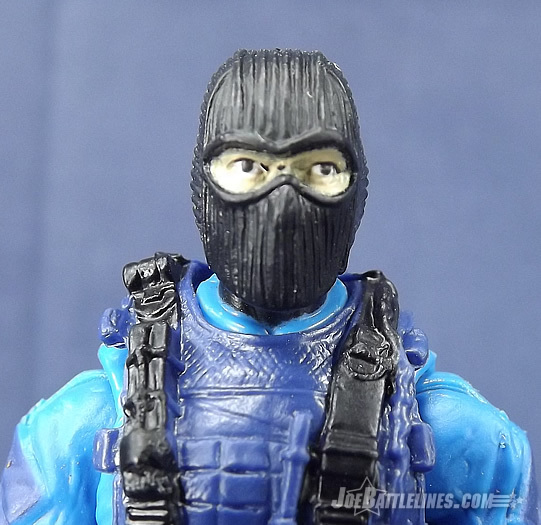 He comes packaged with the same SMG that was used by both the Retaliation Cobra Commanderand the Ninja Duel Snake Eyes, and a scoped rifle that was initially released with the Spy Troops Blackout. 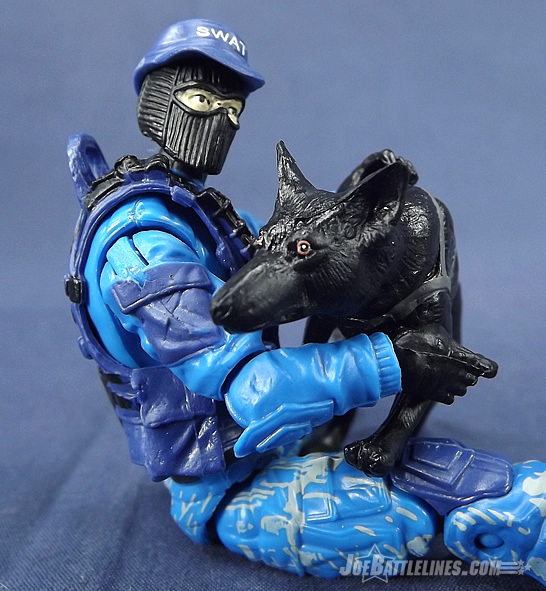 Additionally, his kit is rounded out with a gas mask, ball cap, an over-sized shield from his initial release, and his trusty canine companion Lamont. 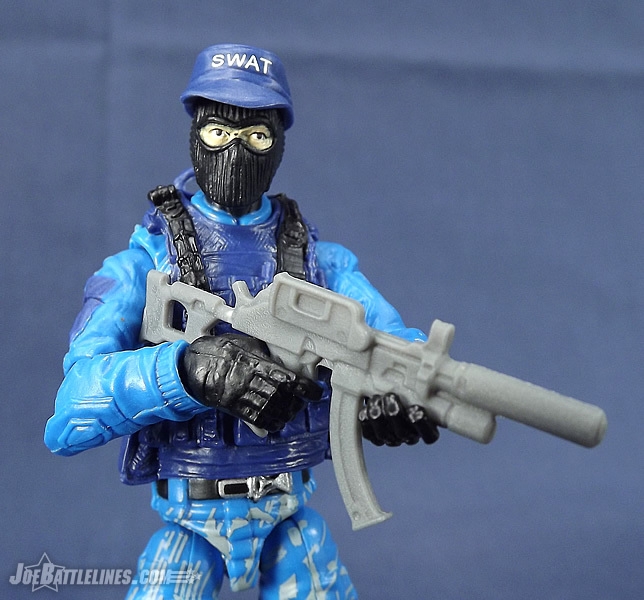 While the Retaliation rifle, hat, and gas mask seem to be properly scaled to the figure the rest of his kit doesn’t fare so well. The scoped rifle seems quite small when placed in his hands while the shield seems positively gargantuan. This is ironic considering that some of these pieces were released with a figure that was significantly shorter than this release. However, the accessory that fares the worst in terms of scale is poor Lamont. In the GvC era, Lamont seemed to be a small shepherd but when paired with a Generation 3 figure he’s positively tiny. In fact, I compared him to Max from the recent Nocturnal Fire convention set and noticed that the bobcat and the German shepherd are almost exactly the same size. Several years ago, my neighbor had a shepherd pup and it was much larger than Lamont appears to be when placed next to his partner. I really wish the Club had either spent the $$$ to produce a new piece for him or used the Order figure from the 30th Anniversary release of Law & Order. Either one might have given fans a dog that appeared to be more than just a few weeks old. However, aside from those scale issues, I’ve got no complaints. Chris? One other thing to mention, is, his cap will not stay on. While I can appreciate it being “removable”, it’s not really. It needs to be “stayonable”. I ended up gluing mine on because I didn’t plan on using the gasmask, but it’s high time we get a new ball cap that will stay on. 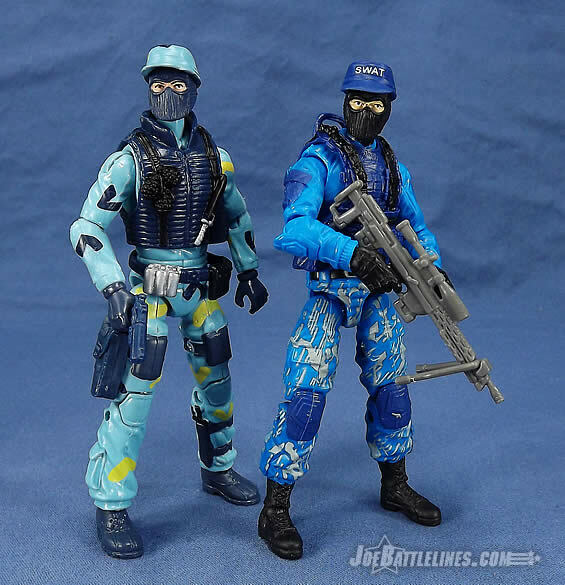 When the GIJCC first announced the roster for FSS 2.0 Widescope was on my short list of “most anticipated” figures. As I mentioned before, I’m a sucker for NEW additions to the G.I. Joe mythos and I’ve got a real soft spot for the characters that debuted in the GvC era. Aside from the some annoying issues of scale in terms of his gear, I really like this figure quite a bit. 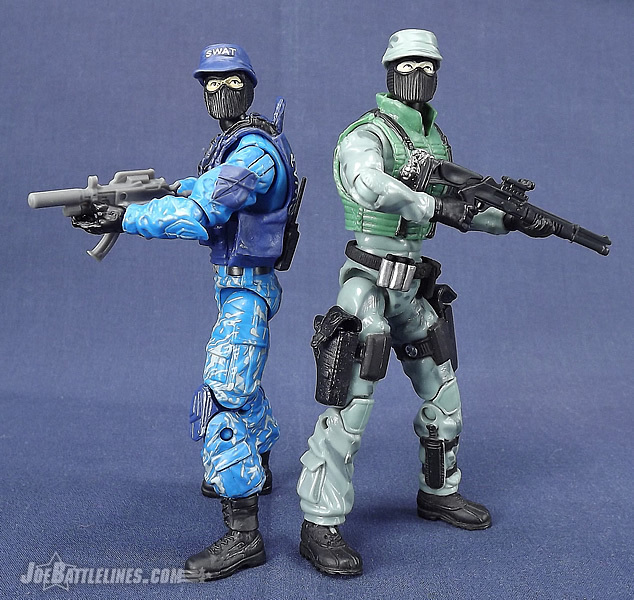 The use of the Shock Trooper body was a no-brainer and the color scheme used really helps make this figure ”pop” when placed next to either version of Shockwave. (Again, can’t get used to calling him “Shockblast.”) He makes a great addition to an urban tactical display. 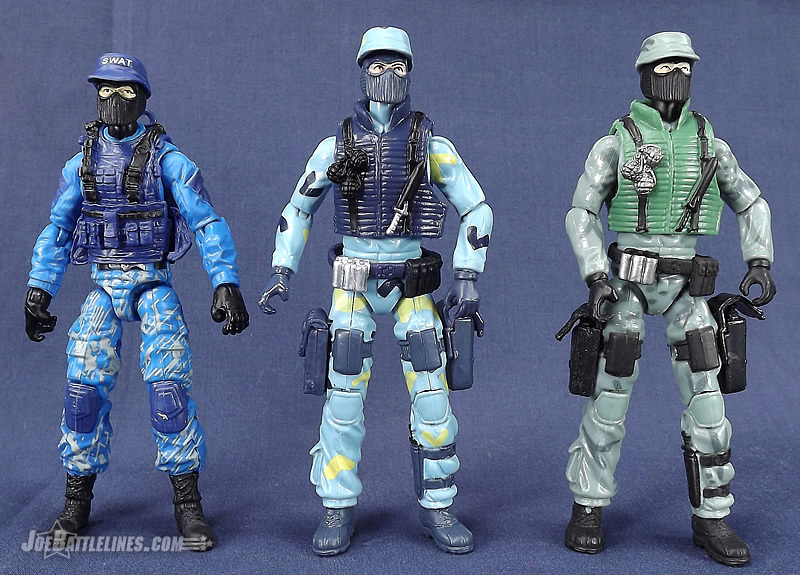 Now, if only the Club would see fit to include more GvC era Joes in future FSS and convention sets. I’m holding out hope for Dart, Sgt. Hacker, Red Spot, Hi-Tech, Hard Drive, and Crosshairs! The bottom line: Even with a pup for a partner, Widescope makes for a great addition to any modern G.I. Joe collection and is worth tracking down!